This is a work in progress, we are just starting. For years we have been talking about a mobile experimental electronics platform, that we could drive anywhere. Now we have a solid base for that. We were just given an electric car, Elcat. Our aim is to integrate mobile experimeltal electronics laboratory and facilities to play electronic sounds straight from the van. 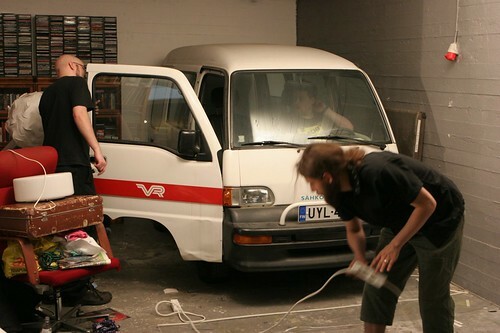 Idea is to integrate all essential features inside the van, so we just drive it anywhere we want to show our stuff. Project will propably advance quite slowly. The first obstacle on our way are the batteryes. 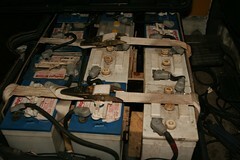 The ones we have are in a pretty bad shape, and new set will cost us about 1000-4000 euros. Beside that we will have to pay quite a lot of money to get the car registered. Among other things we will have to pay DIESELL TAX for not using gas. well project is advancing slowly, we should be getting the car toed to Vallila in couple of days, and after that we will start measuring, planning and of course we must start to gather money for this financially disasterous project.